Health coaching is basically training and systemized methods for improving the health and managing the excellent physical posture of the body. This is an online tool that is used for most health coaching classes that can be conducted via conventional ways or through video/web in virtual environment. This course is specifically designed for health coaching trainers, physicians, body builders and for those who want to adopt their career as health trainers. Holder of health coach certification will be able to cater the need of modern coaching and training techniques for body shaping and tactics to maintain good health and wellness. Increasing rate old ages in the developed economies like US and EU nations where baby boomers of 60’s to 70’s are now getting older, while on other hand, rapidly changing trend in health and wellness programs of human beings around the globe has significantly raised the demand for personal health assistant and professional health trainer. Health coach certification exactly what is required now and in upcoming period. Physicians, doctors and renowned professional health trainer have identified and initiated health coaching is an emerging field. As population in developed countries are getting older as well as trend and awareness about health is becoming more important all over the world, demand for holder of health coach certification also increasing. This online certification will equip you to efficiently manage the health training procedure and develop the skill to tackle the obstacles in this field. Being a physician, professional body-gym trainer, health assistant and prospective coacher in the health field, if you are planning to enhance your training techniques or adopt the new dimensions of health coaching then this certification is the right choice for you. By getting health coach certification, you will become an effective and demanding professional trainer, certified health physicians and coach for physical activities (in school, college or university) who wishes to enhance their skills and effectively deliver their coaching techniques in the field of human health and wellness. The health coach certification program from Brainmeasures is a different certification in terms of contents, syllabus, techniques for good health that will be covered, design and delivery of knowledge which will allow you to become proficient with changing needs of health and wellness profession. This online certification will provide you a competitive edge in both conventional ways of training and online or virtual system of training (where focus is to outreach the services beyond physical boundaries of the nations around the globe) in terms of training and managing your all related activities in efficient and easy to use system. Apart from this, you may also become able to make your own excellent video regarding health tips and training which an added point to increase the earning source. Throughout the course, you will learn about different requirements, components and techniques for maintaining best health and how to deliver the technique and coaching for health towards others. Apart from the course mechanics, learning and competencies candidates (developed via health coaching program) of the enrolled will be assessed through an online exam. You will be entitled with certified health coach and trainer after successfully meeting the requirements and will be awarded prestigious health coach certification from Brainmeasures. This will be definitely an added skill and plus point to improve your resume and will make it easier to get the desired job that requires you to train the people or provide assistance in maintaining the good health. Entitlement of health coach certification also translates to increase in income and better flow of wealth generation as health and wellness is an emerging field which keeps it momentum with age of the people. The average annual salary for those who hold the positions of health coaching physicians, gym instructors, professional health coaching assistant or virtual instructors is around $70,000- $110,000 per year and this amount may vary significantly based on the type of organization, need for health assistantship, awareness about health and wellness, requirements of health and wellness programs in an organization, location and age of the people of target market. 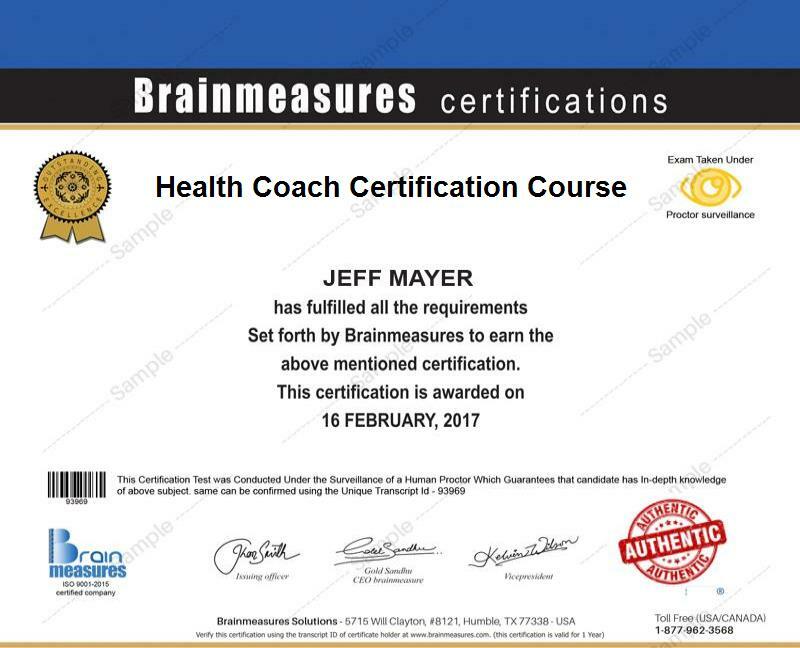 No requirement or minimum qualification is needed to start the health coach certification program offered by Brainmeasures. However, it is expected that the entire program is primarily directed towards individuals who wish to become expert and more familiar about the health tips, coaching and training with changing requirements of the health industry. The course is ideal for aspiring health trainers, professional physicians, gym instructors and for prospective trainers who aim to start coaching/training or already engaged in such system.